If upon review of the site plan a city official – usually, but not necessarily, an arborist or forester – determines that trees must be removed or destroyed or will be injured during construction, a “Preliminary Approval” posting is made by placing a yellow sign on the property for a minimum of 5 business days. The site plans must match the actual site conditions and the affected trees must be marked prominently in orange paint for this posting to occur. 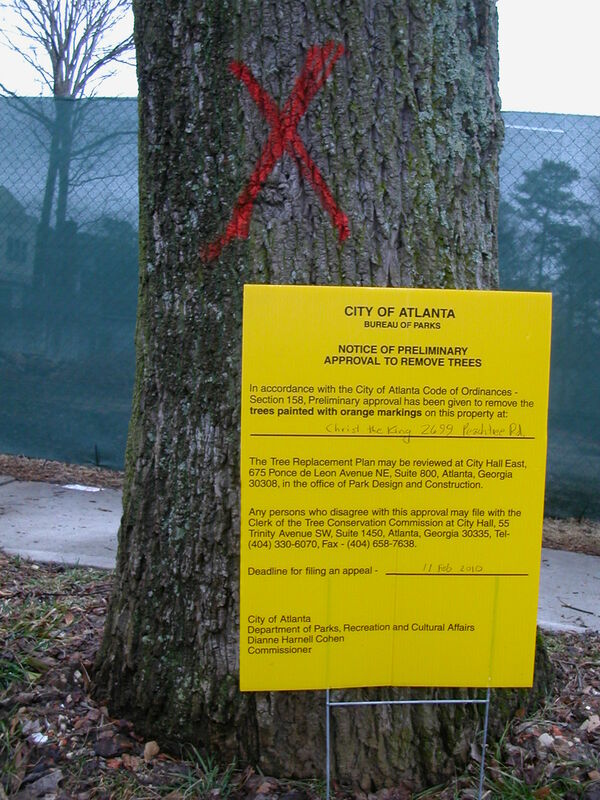 If you see a yellow sign and have not done so already, you should IMMEDIATELY contact the City Arborist Office (contact: Kathryn Evans, Administrative Analyst, 404-330-6235) to obtain a copy of the site plan as well as a copy of the preliminary approval that was issued to remove or injure trees. Any appeal you may wish to make to this preliminary approval must be made by the deadline noted on the sign. An appeal to the preliminary posting must be based on evidence that a decision by a city official misinterpreted or misapplied specific sections of the Tree Protection Ordinance. An appeal is not directed toward the property owner but to the Tree Commission, which determines whether any sections of the ordinance were misinterpreted or misapplied in granting the permit. A $75 administrative fee or a detailed and signed “hardship” letter must accompany the appeal. You can download a copy of the city’s Tree Appeal Package for further instructions and the form to complete to file your appeal. Appeals regarding trees on private property may be made by anyone who owns property or resides within the neighborhood planning unit (NPU) in which the property is located or within 500 feet of the property. Appeals regarding trees on public property may be made by any citizen of Atlanta, any owner of property or a business in Atlanta, or any civic organization in the NPU in which the trees are located. After an appeal is filed, any activity authorized by the decision under appeal is stopped: "no permits shall be issued, no trees cut, nor earth disturbed.” The clerk sets a hearing date and will notify the person who filed the appeal and the property owner. At least two weeks prior to the hearing the filer of the appeal and other interested parties must submit in writing their detailed appeal(s). At minimum, the appeal should include the sections of the tree ordinance that have been misinterpreted or misapplied in granting the preliminary approval. Within one week of the hearing all rebuttal arguments and evidence must be submitted in writing. New evidence that emerges during the week prior to the hearing may be submitted at the hearing if it could not have been obtained earlier. Often, the property owner will contact the appellant directly to discuss the appellants’ concerns. We encourage you to listen to what the developer has to say, but to move forward with the appeal if any aspect of the ordinance is being violated by the preliminary posting. You should not drop an appeal because a property owner attempts to persuade you to overlook the violation in order to be a “good neighbor”. Any threats or acts of intimidation by the property owner towards you or any other appellant should be immediately reported to the City Arborist (and the City Police if the threats include bodily harm or destruction of property). Again, you should focus on upholding the Tree Protection Ordinance and not trying to appease the property owner whose primary concern may be that your appeal is delaying development on the site. If you file an appeal but are unable to provide any facts that could be brought forth at a hearing that could sustain such an appeal, then the appeal can be declared frivolous by a vote of the Tree Conservation Commission in advance of the hearing. Often the property owner will claim that an appeal is frivolous in hopes that the commission dismiss it in advance of the hearing. The commission will hear your case if you are able to demonstrate how the Tree Protection Ordinance has been misinterpreted or misapplied.